American audiences largely think of animation as kids stuff. There have been exceptions (the work of Ralph Bakshi, the R-rated sci-fi anthology HEAVY METAL, a pair of interesting features from Richard Linklatter), but since these films deal with subjects that appeal mainly to cult audiences, the general public's perception hasn't been changed much. To be sure, Pixar has produced a number of films with thematic and emotional depth that resonate with audiences of all ages, but American animated features that deal with truly adult subject matter are almost nonexistent. For that, you pretty much have to look abroad. In recent years animated films like PERSEPOLIS, THE TRIPLETS OF BELLVILLE, and WALTZ WITH BASHIR have garnered critical praise and some commercial success while helping to show that animation can be used to tell all kinds of stories, and that the stylistic possibilities the medium opens up can be used to enhance those stories in ways that would be impossible with live action. 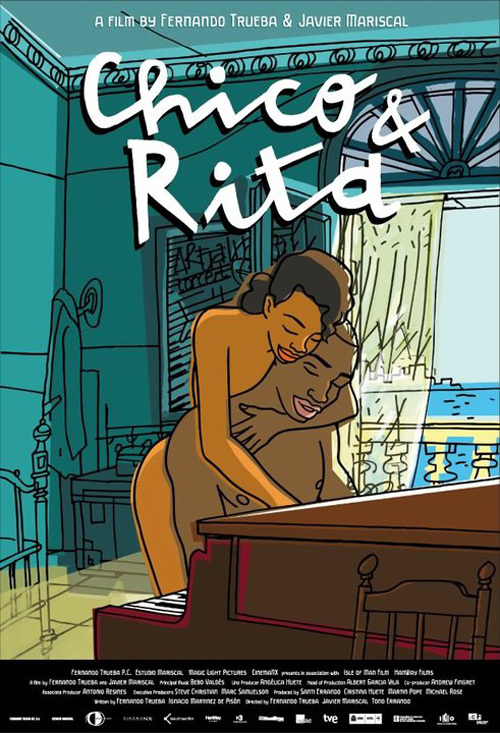 Now Spanish directors Tono Errando, Javier Mariscall and Fernando Trueba have given us another example in CHICO & RITA, a sweeping love story set against a backdrop of the history and influence of Cuban jazz. We first meet Chico as an elderly shoeshiner living in Havana. Returning to his apartment after the day's labors, he turns on the radio and hears a song that takes him back to his youth in pre-Castro Cuba. Back then, Chico was an up and coming jazz pianist looking for the right vocalist to perform with at a talent contest. While out carousing with his friend Ramon and a couple of “Yankee” girls, Chico finds that singer in the person of Rita (voiced by Limara Meneses), who is performing in a bar Chico and his friends stop at. Chico is instantly smitten with both the woman and her voice, although it takes Rita a little longer to warm up to him. Not that much longer, though. The two share a night of passion, and in the morning Chico wakes up and writes a song about his new love. Unfortunately his old love is still around, and she's none too pleased to find another woman with her man. Rita isn't exactly innocent, either, resorting to prostitution to make ends meet. Obviously there are going to be some trust issues. 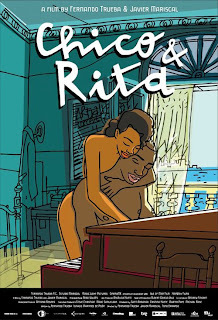 The film follows Chico's memories as he and Rita leave Havana separately, both eventually coming to America to pursue fortune and fame in the music business and wandering in and out of each others lives several times. Aside from the love story, we also see the impact Cuban immigrants had on American jazz. Chico and Ramon are friends with Chano Pazo, a real life percussionist who played with Dizzy Gillespie and heavily influenced the direction of Gillespie's music. Meanwhile Rita finds an American sugar daddy who makes her a star not just as a singer, but in Hollywood movies. Chico achieves some measure of success as well, but success alone can't make up for the loss of true love. I found the love story here more believable than most live action romances. Even the requisite roadblocks to happiness thrown in Chico and Rita's path felt like the kind of problems these two would actually have to deal with rather than the silly contrivances we so often see. The protagonists are complex and don't always behave like they're trying to please the audience, and because of this the ending feels earned rather than preordained. It's nothing revelatory, just better than most of what's out there, but combined with the film's vibrant setting and music it adds up to a solidly enjoyable whole. The art style in CHICO & RITA is somewhat primitive looking (Peter Debruge of Variety describes it as “lousy”), but it's an intentional choice that reflects the style of co-director Marsical. As for the animation itself, thanks to a computer assist it's as smooth and fluid as any mainstream cartoon. The end product may not be what most people are used to in an animated film, but not everything has to look like Disney. Style should fit story, and I think it does here. 3 out of 4 stars.